How effective are your interactions with others? What behaviors enhance your effectiveness, and what behaviors undermine your effectiveness? How do people perceive you? What behaviors positively affect the way you're perceived, and what behaviors make a negative impression on others? 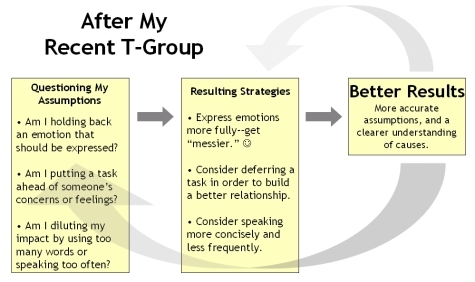 Getting answers to these questions is one reason why people participate in T-groups (the T is for "training"), an interpersonal development methodology developed by social psychologist Kurt Lewin. I recently participated in a T-group as a facilitator, and the experience led me to think further about the underlying mechanisms at work. The first graphic below (here's a larger version) reflects what happens in most of our personal interactions, which can be described as single-loop experiences. We carry with us a set of underlying assumptions about how we interact with others--for example, we believe that certain behaviors are effective and other behaviors are ineffective--and these assumptions form an implicit strategy that governs the behavioral choices we make in our interactions. We may observe the success or failure of an interaction, learn from the results, and modify our behavior in some way, but we rarely challenge our most fundamental assumptions. 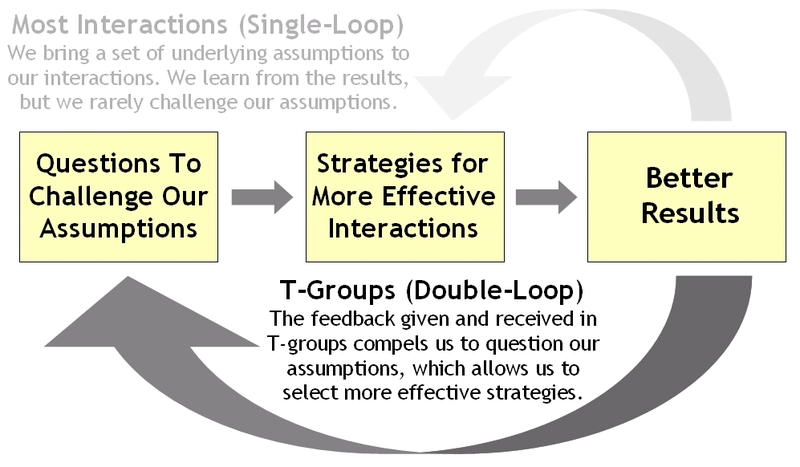 In contrast, T-groups are an example of double-loop learning in action. One of the primary activities in a T-group is giving and receiving candid feedback on the effectiveness (and ineffectiveness) of our behaviors. 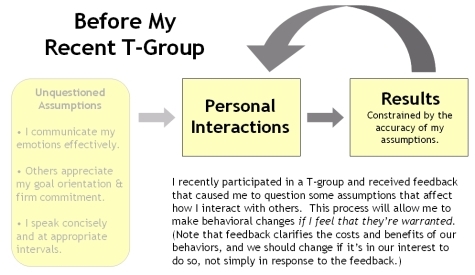 Because of the trust that develops among T-group participants and the high value placed on candor, this feedback can be disconfirming and even difficult to hear. It's so much more direct than the feedback we get from other sources that it changes our frame of reference when analyzing our interpersonal effectiveness. Rather than simply asking what we might have done differently to improve the outcome of an interaction, we begin to see that all our assumptions about what's effective and what's not limit the range of choices available to us and circumscribe how we interact with others. To get more specific, let's look at my recent experience in a T-group. As I note in the graphic below, feedback should be regarded as information that clarifies the costs and benefits of different behaviors, and we should change our behavior only if we decide that it's in our interest to do so, not simply in response to the feedback. But understanding the impact of our behaviors on others (and the resulting costs and benefits to us) can create a powerful motivation to look more closely at the assumptions that frame our behavioral choices. I communicate my emotions effectively. Others appreciate my goal orientation and firm commitment. I speak concisely and at appropriate intervals. Am I holding back an emotion that should be expressed? Am I putting a task ahead of someone's concerns or feelings? Am I diluting my impact by using too many words or speaking too often?